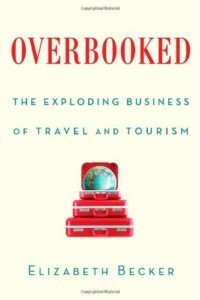 Here’s a list of books which we think tourism professionals will find useful for making your business or destination more sustainable. Want to suggest a book for review? Please get in touch. 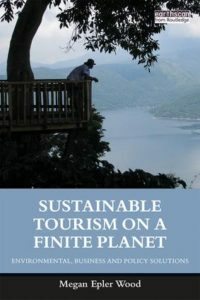 Sustainable Tourism on a Finite Planet challenges readers to consider the new skills, tools, and investments required to protect irreplaceable global resources from the impacts of escalating tourism demand in the next 50 years. The book documents how technology is driving a travel revolution and propelling the growing global middle class to take leisure trips at unprecedented rates. Travel and tourism supply chains and business models for hotels, tour operators, cruise lines, airlines, and airports are described with key environmental management techniques for each sector. Tourism, fast becoming the largest global business, employs one out of twelve persons and produces $6.5 trillion of the world’s economy. In a groundbreaking book, Elizabeth Becker uncovers how what was once a hobby has become a colossal enterprise with profound impact on countries, the environment, and cultural heritage. Becker travels the world to take the measure of the business: France invented the travel business and is still its leader; Venice is expiring of over-tourism. In Cambodia, tourists crawl over the temples of Angkor, jeopardizing precious cultural sites. Costa Rica rejected raising cattle for American fast-food restaurants to protect their wilderness for the more lucrative field of eco-tourism. Case studies are an indispensable learning tool, not only in the classroom but also in academic research, consultancy and practical business management contexts. Case studies present real situations, allowing a balance of theory and practice. They have the power to transform the learning the abstract and uninspiring to one that is targeted and vibrant. 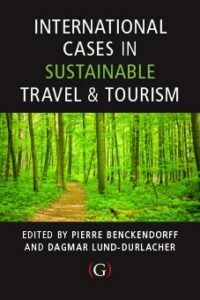 International Cases in Sustainable Travel and Tourism provides an international range of outstanding new cases focused on sustainable tourism management and development, including award winners and finalists from the WTTC Tourism for Tomorrow Awards. 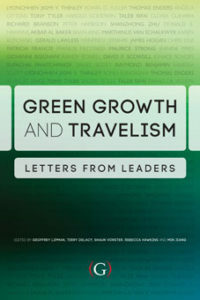 Green Growth and Travelism: Letters from Leaders explores why the industry is misperceived and how it can take its rightful leadership place in the transformation to the new green economy. First the authors explore Green Growth as the new geopolitical paradigm to respond to the big social, economic, environment and climate challenges of today and the population driven resource challenges of tomorrow. They then analyze how Travelism – the Travel and Tourism value chain – transport, hospitality and the various industries that support our inexorable urge to move around this planet – can more effectively contribute to a positive long-term societal transformation. Taking this viewpoint, the ‘Letters from Leaders’ provides real evidence of the actions, viewpoints and hopes of those at the frontline. Taking Responsibility for Tourism is about the globally vital necessity of realizing sustainable tourism. It is a hugely important challenge to those who organize and sell travel and tourism, and those who consume it. 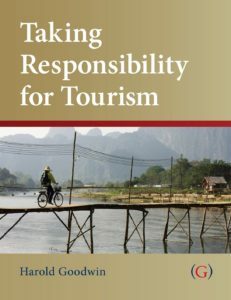 Taking Responsibility for Tourism is not a book about a niche product; major trade associations and large and small tour operators are committing to the objectives of responsible tourism and shouldering their responsibilities. This powerful new handbook is the most authoritative contemporary overview of the key issues that are critical for the progress of responsible tourism and is written by one of the leading thinkers and change-makers in the field. It applies the broader concept of responsibility to travel and tourism, and looks at how it relates to sustainable business and the business case for responsibility. 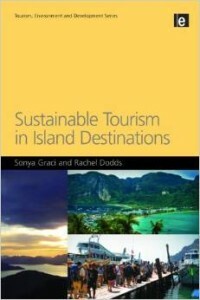 Sustainable Tourism in Island Destinations examines sustainability issues in an island context and, through an illustrated case study approach, it focuses on the successes and challenges islands face in achieving sustainable tourism. Innovative mechanisms such as multi-stakeholder partnerships and incentive-driven non-regulatory approaches are put forward as ways that the sustainability agenda can move forward in destinations that face specific challenges due to their geography and historic development.